I grew up during the days when our country was fighting for independence. Mahatma Gandhi showed us the way. He said to enthusiastic young people like me that “if you attain freedom at the point of a gun, the gun will rule over you. The way in which you attain your freedom is more important than the goal itself.” So when we fight on the path of truth and nonviolence, we attain true freedom, because freedom comes from within, it cannot be given. This was a difficult but important lesson for us to learn. When I started working with textile laborers and then began organizing poor, self-employed women, I was struck by the great poverty of the working poor. They worked so hard, so why were they still poor? Poverty is violence against human dignity. So I started realizing that poverty is violence. Poverty is violence against human dignity. And war is the crudest form of violence, but an unequal society is equally violent. Poverty is chronic violence. People suffer daily traumas that are physical, mental, and even spiritual. I found that people turn to physical violence after they’ve suffered many other forms of silent violence in their daily lives. So, lastly, this made me see violence and nonviolence in a different light. Niwano: Unfortunately our world is a world where “survival of the fittest” is the rule, where “might makes right”. To be able to use nonviolence to resolve the problems that come up, religious compassion, love, and courage are absolutely essential. This may not be feasible unless we humans achieve a very advanced state. Nonviolent is often thought of as generally meaning powerless. But were not Gandhi’s spirit and actions able to lead India to independence, overcoming this perception and proving that nonviolence is not powerlessness? Bhatt: I think we have to learn from children. We do not have to say anything to them,because their hearts are full of love and pure and always truthful. But it is we adults who would teach them violence in thousands of ways. But if I have to say something to them, I would say that when you fight with your body or with a weapon, the stronger person will win, and it will not matter whether they are right or wrong. But I tell them that if you win over your opponent’s heart with love and truth, you will both win. I tell them that nonviolence requires courage. Only the truly strong can be nonviolent even in the face of violence. I tell them very simply that fearless children do not need guns and swords. Niwano: Mr. Masahiro Yasuoka, an authority on Eastern thought, political philosophy, and the neo-Confucian teachings of Wang Yangming, wrote on the topic of “the path of coping with evil.” This is something I have studied since my youth, and I think it’s very apt. So please allow me to introduce you to his work. Mr. Yasuoka points out that to follow the path of coping with evil, one must understand first that “because of the reality of survival of the fittest, the weak will lose to the strong,” and second, that “responding to violence means, in other words, taking a vengeful attitude.” These are the most general attitudes one may take to cope with evil. Are the activities that you are promoting born of a wholehearted conviction? Bhatt: I’ve been saying this all the time. If you focus on the positive attributes of womanhood, you will find a natural way to bring harmony and balance to society. A woman wants to live and work and bring up a family in a stable community. She wants roots for her family. She is a natural forger of bonds with her neighbors and with the wider community. She is a stabilizer, a networker, a worker, a provider, a caretaker, an educator. So, essentially, woman is both a creator and a preserver. Every woman is past, present, and future. So a woman’s participation and representation is an integral part of the peace process. My experience, both at the national and international levels, has been that women bring constructive, creative, and sustainable solutions to the table. Women feed, clothe, and shelter families. They invest in the next generation. That has been my daily experience through SEWA. What I’m saying is not superlatives, and it’s not rhetoric. It is my experience in SEWA. So, I firmly believe that with women’s leadership we would have a more peaceful, constructive society. A gentler economy. And a holistic approach to politics. Niwano: When you point out that in human life women play an important role in all aspects, I think you are absolutely correct. In the words that have been passed down to us as Shakyamuni’s, a mother’s influence is cited as a most important component that builds one’s character. It is the mother that teaches a child tenderness, warmth, and consideration for others. These are the values of cooperation, being helpful to others, and sharing. In building a harmonious society, these maternal characteristics are absolutely essential, and it would not be wrong to say that they are what Shakyamuni desires. On the other hand, masculinity is associated with efficiency, productivity, rationality, and the like. Its aims are self-assertion and surpassing others. There are indications that such paternal characteristics have caused various inconsistencies in modern society. You have said, “Women must become the leaders of social change,” and I think that is also demanded by the times, is it not? Bhatt: What I am talking about is ‘the feminine way’. Not woman in a narrow sense. So, by feminine leadership I mean not only more women leaders but also leadership by men who are feminine. Men, too, can restore a balance between humans and nature, between livelihood and the business corporation. But the woman’s way has a different sense of time, a different pace of growth. And it puts people before profits. It puts subsistence before surplus. So that is the feminine way that I mean. For example, let us look at the way women around the world live in the environment, and why it is important. I’ll tell you that their lives are lived closer to nature. They consume less. Women make products that nourish and enrich human lives. For women, sustainability is tied in with daily living. Women recycle, women economize. Women treat the environment with care, because they are thinking of their children. So, their motive is first sustainability and then profit. And that is the most nonviolent way of living. Nature, which is Mother Earth, has to be treated with respect and love. Not exploited. Yes, so that’s why I link nonviolence and women so closely. Niwano: Mr. Yasuoka, whom I quoted earlier, also said, “The father must be respected by his children.” A child will not respect the father if he has only been pursuing quick profits or efficiency. Ordinary words and deeds are also important. The father must not lose track of the need to improve himself through self-assessment and constant learning. Is it not the father who particularly has the role of providing economic and mental stability for the family, and does this not create the basis on which the mother can impart to her children tenderness, warmth, and consideration for others? Bhatt: What I admire so much is that Japanese women are strong. I so much admire their beauty and their grace, since I have seen women in Japan in their daily lives; they live with grace, and a sense of detail. I am a big admirer of Japanese crafts. Your textiles, your baskets, your attention to detail are everywhere to be seen, as are your love of nature and your spirit of finding beauty in old and worn-out things. Japanese women are carriers of that rich cultural heritage. And at the same time, they are modern and dynamic, brave and strong. This is what all women in Japan are like. You see, I don’t think happiness has anything to do with affluence or poverty. Joy is in finding out what makes us human. I mean celebrating life on earth as members of a large family of humans and animals and plants. You all have personally experienced that the joy is in sharing, in loving, in relating, in knowing the unknown. So we are bound at all levels. I mean joy is in understanding each other and happiness is in sharing a meal, or our courtyard. So that is what I mean by happiness. Affluence has nothing to do with it. We need a world view that embodies community rather than individualism, subsistence rather than surplus. I think the challenge that we all face today is how to listen to the voices of the people? How do we empower people at the local level, by empowering local people and the local economy, local resources? How do we let diversity flourish? By enabling many more people to enjoy freedom. And let us make sure that the voices of the poorest are heard. I think these are our common concerns. Niwano: In the past, Japanese people placed great importance on the spirit of “knowing that one has enough” or being satisfied with what one already has. That spirit has been gradually forgotten, however, due to our postwar education system, and we seem to have been possessed by an idea that material abundance means happiness. As we now face a global recession, such ideas are causing people to think that this will mean unhappiness. Those of us who are engaged in religion must firmly tell people that human happiness is not found only in material abundance. If we change how we look at things, we see that just being given a life as a human is itself a miracle. At the same time, we are being permitted to live here now, with countless blessings. It is very important to be grateful for this and to nurture the spirit of being satisfied with what we have. The word abundance generally refers to material abundance. However, Gandhi, who was a saint, and Shakyamuni were both focused on nothing so much as a spiritual abundance. We, too, have been given such power to see fully the true nature of things. I believe it is important to awaken to that. Bhatt: In India we have given birth to the Buddha, but he lives today in the hearts and minds of people all over the world. He lives now . . . I mean, the Buddha’s life and ideas are celebrated here. His spirit lives on far beyond the land of his birth. I feel delighted to learn that; this is how we are all bound together. I mean bound together now and for centuries. So, let us overcome the mind-set that is still rooted in narrow terms. By narrow terms, I mean actually that this is my land, my language, my people, my knowledge. The entire world is our family. EDITOR’S NOTE: Ela Ramesh Bhatt is also the founder of SEWA Cooperative Bank. 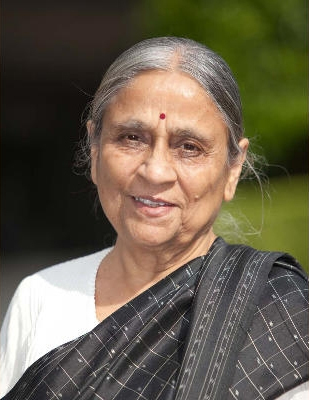 She was a Member of the Indian Parliament and subsequently a Member of the Indian Planning Commission, founded and served as chair for Women’s World Banking, the International Alliance of Home-based Workers (HomeNet), Street Vendors (StreetNet) and Women in Informal Employment: Globalizing, Organizing (WIEGO). She has also served as a trustee of the Rockefeller Foundation for a decade, and has received many awards, including the Ramon Magsaysay Award, the Right Livelihood Award, the George Meany-Lane Kirkland Labour Rights Award (AFL-CIO/USA) and the French Légion d’honneur, as well as honorary doctorates from Harvard, Yale, and Natal universities. She is a member of the Council of Elders brought together by Nelson Mandela (2007), and is the author of We Are Poor but So Many, New York: Oxford University Press, 2006. Nichiko Niwano is president of Rissho Kosei-kai, a worldwide Buddhist organization founded in Japan in 1938 by his father Nikkyo Niwano, and Myoko Naganuma. Its purpose statement says that it “combines the wisdom of both the Lotus Sutra and the foundational teachings of Shakyamuni Buddha, to bring these transformative teachings to the modern world.” The article is courtesy Dharma World, April-June 2011; www.kosei-shuppan.co.jp/english.